Pool Repair - Rintoul's Leisurescapes - Above Ground, Inground Pool and Landscape ideas for Owen Sound, Port Elgin and surrounding areas. 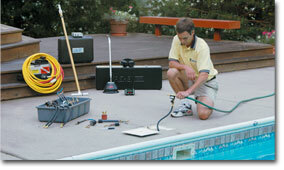 A leak in your pool can cause alot of distress, but there is no need to worry. At Rintoul's we have professionals trained in detecting the leak and identifying a solution. Using an Anderson listening device we can accurately locate plumbing leaks by sensing the "sound" air makes when escaping from a leak into saturated soil. Call us for more information we'll have you back by the poolside in no time!